[SOLVED] "Qt5Widgets.dll" is "missing from my computer"
» [SOLVED] "Qt5Widgets.dll" is "missing from my computer" Welcome back, Guest. Hi there! I've been having some problems recently with Whatpulse since around version 2.4 (ish? ), and am currently running 2.5. I've enabled "Launch when computer starts"--however, when I start up my computer, Whatpulse tells me that it can't start because "Qt5Widgets.dll is missing from my computer", and that I should try to reinstall the program in order to fix this. I've reinstalled the program two times now, but this doesn't seem to do anything. I've also checked the folder to confirm, and Qt5Widgets.dll isn't actually missing. 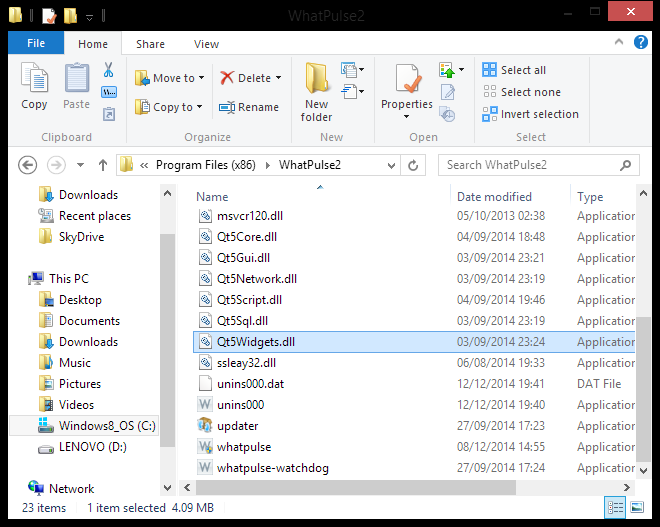 RE: "Qt5Widgets.dll" is "missing from my computer"
Could you check if you don't have another whatpulse.exe somewhere which is the one starting up at boot? Task manager -> Startup tab -> Right click WhatPulse and open the file location, see if that's the same as your installation directory. Re-enable the startup setting, or create a startup config manually in Windows.